If chicken can double for hamburger and hot dog buns, then surely, it will work as pizza crust. What could go wrong? 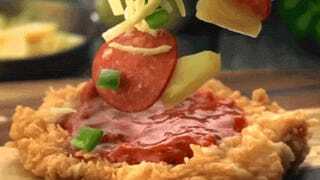 In the Philippines, KFC is rolling out what it’s calling, wait for it, Chizza. Geddit? Heh. So far, this doesn’t appear to be available elsewhere. But before you think that might be for the best, TAY seems to like it okay, calling it “surprisingly good.” Read the full review right here.